A half-dozen battered books lie on a table, their thin spines marked with faded French writing. Nowadays, they look harmless. But during the French Revolution, these pamphlets were more dangerous than pistols. The UBC Library’s French Revolution Collection has assembled and catalogued almost 200 pamphlets, plays and documents from between 1789 and 1799, creating a window into a decade of political turmoil that rocked Europe to its core. Associate Professor Dr. Joël Castonguay-Bélanger will be teaching a course on the revolution next semester, where the collection will be part of the work. “This is going to, I hope, offer a window of what it actually looked like on a daily basis to be living in Paris and seeing the interaction between the public discourse, the speeches and the political context,” said Castonguay-Bélanger. These aren’t the kind of pamphlets you get handed on Imagine Day. During the French Revolution, lengthy pamphlets were the à la mode way of communicating the latest scandal, outrage or opinions. Depending on who wrote them, pamphlets could be landmark treatises on the rights of human beings, collections of crude jokes that viciously ribbed politicians and kings or even calls for public executions — some of which actually happened. “There were thousands of texts that we know triggered political upset at the time,” said Castonguay-Bélanger. 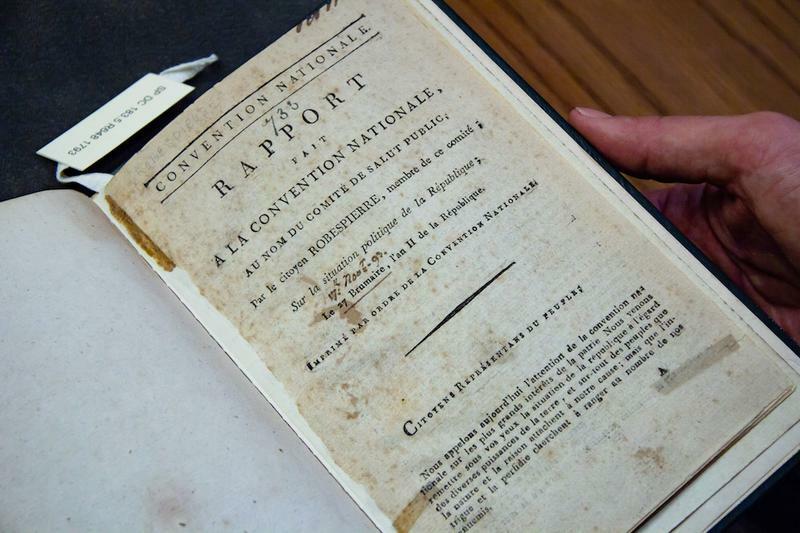 Some of the documents in the collection — like pamphlets from then-journalist Camille Desmoulins and a report written by the infamous Maximilien Robespierre — defend the most violent parts of the Reign of Terror. Others were written by common people and journalists who took the newfound freedom of the press to new, often crass, extremes. Those ideas never went away, and neither did the controversy. Over 200 years later, the French Revolution continues to shape politics in France and across the world. Castonguay-Bélanger notes that in 2014, when an instalment of Assassin’s Creed was set against the revolution, it drew ire from left-wing politician Jean-Luc Melenchon, who argued the game was an unfairly violent characterization of the revolution’s ideals. “Every politician in France has to position themselves in relation to the revolution,” said Castonguay-Bélanger. “What to make of the terror? What to make of a figure like Robespierre, who has become incarnate of the most bloody episode of the revolution? But, Castonguay-Bélanger cautions that the revolution shouldn’t be reduced to the macabre. While “every student knows about Louis XVI and the guillotine,” the revolution was also the era of the Declaration of the Rights of Man and the Citizen, the abolition of slavery and the revolution of the modern state. The French Revolution Collection can be viewed at the Rare and Special Collections department of the Irving K. Barber Learning Centre.